No matter how many rooms there are in the house, the size of your home or the external conditions, Thermia Link’s new features are ideal. They make it possible to adapt heat production from the pump to any situation, precisely suiting your family’s preferences. Not only can you adjust the temperature for your own comfort, you also have full control over your home’s energy source. 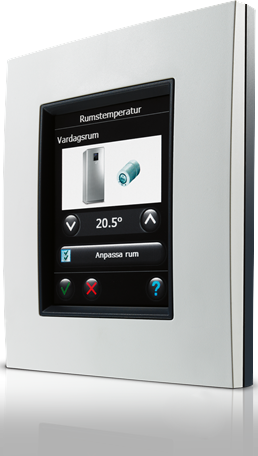 Thermia Link communicates continuously with the heat pump. This means that the fully integrated system is optimized for current conditions, using as little energy as possible at every stage. As a result, your investment can bring you up to 50-75% energy savings. The Central Control Unit is now compatible with your heat pump and is the only solution offering full control of your entire heating system. Energy use in each room can be managed separately and adjusted to your personal needs via a number of options, such as daily and weekly schedules. For extra reductions in energy use, you can set a minimum temperature when you are away for extended periods or at night. This enables effortless, significant savings. Not only can you now easily adjust the temperature in the entire house from one place – you can also optimize your heat pump’s operation according to the current conditions of your heating system. All this functionality is in easy reach from anywhere you want to be, anywhere around the house. This red dot design award winner fits in any space, giving you a modern combination of functionality and perfect aesthetics. Control the whole heat-pump system from one place. Thermia Link is a revolutionary innovation that delivers additional benefits to the heat pump. With the wireless control unit, which you can locate anywhere in the house, it is easy to individually control the temperature in every room. Air and ground source heat pumps have the potential to reduce your home’s CO2 emissions by up to 50% and can act as your individual contribution to the commitment to source 20% of European energy from renewable sources by 2020.